Last night I finished Jupiter and made it into a coaster. I only had 2 colors left in the pattern when I put it down 6 weeks ago. I also may have figured out a solution to the picture frame problem. I’ll be in the shop this afternoon and will see if it works then. Check back tomorrow! Hey look! Finished coasters! I never thought I’d see the day. When we last left this project I had worked for a whole month on the needlepoint and had only finished four of nine planets. (Jupiter is almost done and should be finished by the end of the week.) At the time I wasn’t confident in the method I was considering to finish them. Last night I decided to just go for it and I think they turned out ok.
First I cut out each planet and sewed a thin strip of bias tape for a more finished look. I then attached a circle of cork to the fabric with spray adhesive. What was so hard about that? – I enjoy having a small handwork project to work on in the evenings. Needlepoint is a great option. – It would be better to try something and fail than succumb to weeks of analysis paralysis. – I hate having an undone project hanging over my head. I’ll work on the rest of the planets from time to time and try to finish all of the coasters by the end of the project. Then we’ll just need to get into the habit of using coasters! I apologize for the lack of a project post this morning. I had a day off yesterday and used it to get the bulk of my work done for next week’s project. But that doesn’t mean I haven’t been working on my cross stitch! Today I brought Jupiter to DownTown Knits so I could join Cheryl of Knitting My American Dream for part of her April knitting marathon. It was fun hanging out in a cool yarn store with another crafty friend while we both raced to finish our projects. 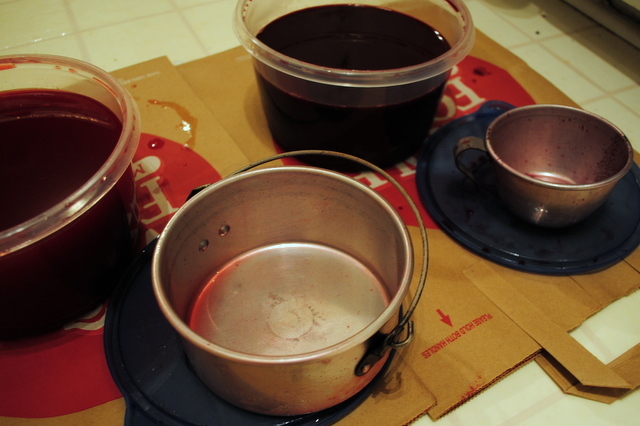 Then this evening I finally gathered my thoughts about the coasters and purchased some supplies to finish them. I’ll pull out the sewing machine tomorrow (Friday) and see if I can get the first four done. I hope to continue past the end of this week so I can finish all nine (yes, including Pluto). I hope to post some finished coasters tomorrow! I started this project the first week of April because I had a hunch it would take me longer than a week to cross stitch 9 planets. What I learned is that it takes me about a week to do each one. I hope to finish Jupiter by Friday and will continue as I find time until all of them are done. Mine are a little bit bigger than the ones in the example photo. The pattern creator was able to find 14 count fabric (14 stitches per inch) and all I could find in the black was 18 count. I also haven’t yet quite decided how to make them into coasters. Hopefully by the time you check back tomorrow I’ll have some done! Buying materials for this project was a lot of fun. When I was a teenager I used to buy embroidery floss to make knotted friendship bracelets — this shopping experience took me right back. I had a list of colors for the project in hand and just stood in front of the wall of flosses picking out the ones I needed. I was even able to find a black fabric instead of the usual white, thus saving me a lot of little black x’s. The cost of all of these materials was well under my weekly budget. If time is money, however, this one may be the most expensive yet. Check back tomorrow for my progress so far. This week I am going to take advantage of these great cross stitch instructions for all 9 planets* and probably turn them into coasters. I may not get them all done by the end of the week, but stay tuned to see how they turn out! You are currently browsing the archives for the Needlepoint category.